It is still very close, and could go either way. I expect both of you wily battle-scarred veterans to be using every trick in the book - curious what he did. @HULK…Karma went for a bold attacking move and I defended in a way that he hadn’t expected, namely I jumped all the ships from a neighboring planet to it guarding the warp gate and leaving the other one undefended. I held the important planet with 52 ships remaining. Our research has gone different directions. He stayed on Man. I went for HYP 5, Scanner 5 and Scanner 6. It’s opened up all his planets (and warp gates) on his back lines to me now. Update. We are at tick 368. We are nearly equal at all levels overall. We are in advanced sciences…Man 6-7, Terra 5-6, Scanning 4-6, Hyp 4-5. We are both at industries approaching 100 ships/hour and science at 55+. Economies are nearly equal with $2200+ being spent each cycle. Here is a snippet of our front line. The east side is bogged down. The west side is becoming chaotic. The way to break out of a WW1 trench warfare situation is to identify the tiny small advantage that you have, figure out how to amplify or multiply it, and eventually make the advantage bigger and bigger.
. . . and then travel back in time. I just attacked his one spot that I deemed the weakest and captured a planet. Of course, it now has made a weak spot in my armor. The all out blitz by both sides has started. Attacks are going on left and right now. LOL - glad to hear the game has progressed from trench warfare to all-out blitz’es! We just finished our 19th cycle. I will admit that I wasn’t sure the game was winnable (with our galaxy set up) and got frustrated. From that frustration I decided to play more aggressive and a bit reckless and, tried anyways, to be unpredictable. The result now is that the tide has turned. Karma is unbelievably tough, but I have the momentum now. Karma: 58 planets, 228 economy, 207 industry, 71 science and 5600 ships. Me: 68 planets, 230 economy, 234 industry, 84 sciences and 6600 ships. 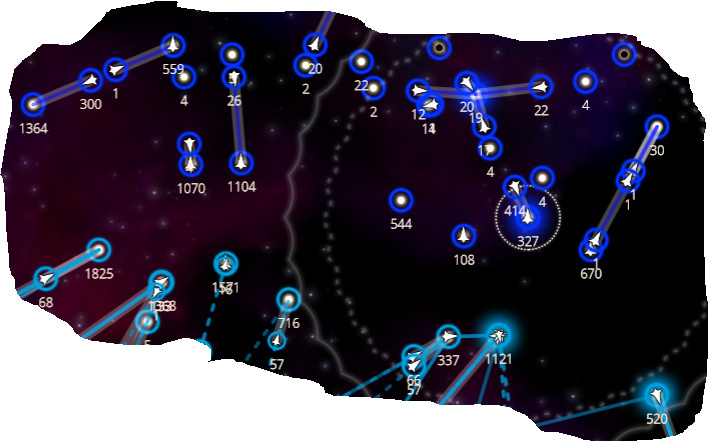 In the last 24 ticks we have wiped out 1/2 of our ships in clashes. We have Man 10, scanners 5-6, hyp 7, terra 6 and battle with 63 carriers for him and 84 for me. When HULK and I played before we had hoped fixed weapons would open up a whole new level of play and make the lesser sciences more important. It has. I will admit it’s taken awhile. Thankfully Karma and I both submit regularly. 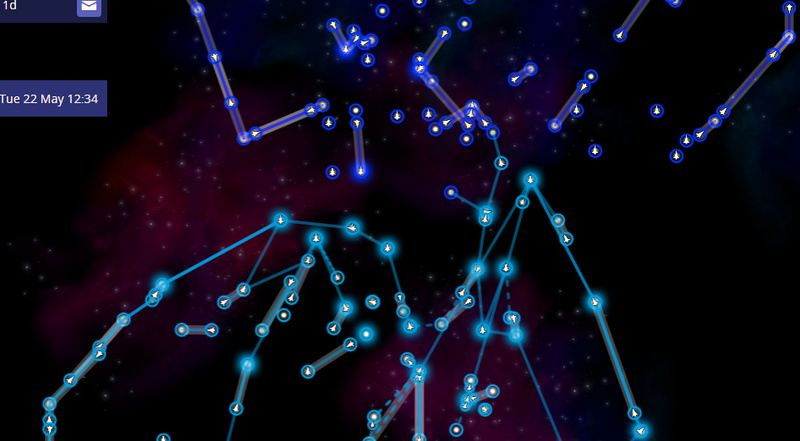 The play now is a warp gate battle all over the galaxy with big jumps and big risks. I think this bodes very well for the rest of the tournament! Phew, now I can relax, boy that was tense. That was one heck of a game!! Here is the final map. So how is everything looking so far? Which games are still ongoing and what has already been completed? My game is finished. Your game Grunter is pretty much set and moving to a conclusion with you seeming to be the dominate player there from the stats. That leaves 1D, 1F, and 1G games. Click on the alien headshots to read limited stats. Ahhh, I’ve been missing out! Thanks a lot. @SuperDave and @Karmadrome: From what I could tell as a spectator (and reading your updates), that was one heck of a game - too bad you guys had to battle in the first round rather than the FInals! It sounds like after the initial stalemate, that the game progressed to a point where the “weary prizefighers” were throwing punches wildly at each other! Again, I’m sorry you ended up with a galactic map that was a bit tight - I’ll try to make sure subsequent ones are a bit more open with more areas for conflict. Any other suggestions on parameters, etc.? ALL: I have updated the first post to show that @SuperDave advances. Looking at the other games, it appears that one player has about a 20 star advantage. Don’t know if that is enough to insure victory, but appreciate both players moving things along so we can finish up round #1 … and advance to the quarterfinals. As mentioned above, any feedback on the game parameters … or should we do exactly the same for round #2? @HULK I’m good with the parameters. I think my game with Karma showed that eventually everything has the potential to break open. I have Range 3 against his Range 2. All other techs equal. I’m losing but will continue until game is finished or all other round 1 games have been completed.